The cold waters still bring fish rich with fat that shines in sashimi or is nice for grilling. Asari clams are great for making into a quick vongole style pasta. And perhaps my favorite this time of year is katsuo simply seared on the edges, sliced thickly, and served with some soy sauce and garlic. 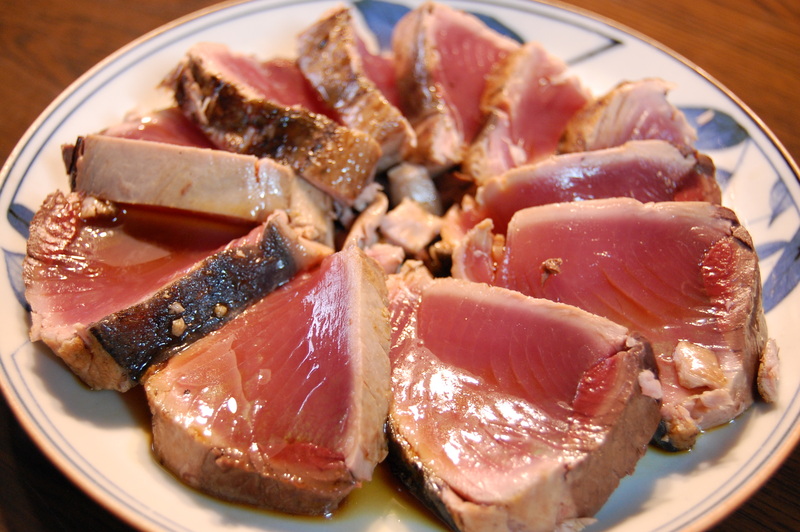 This time of year, the katsuo is referred to as “hatsu-gatsuo”. Katsuo actually is in season two times a year. This is the first time we see it, hence the name “first katsuo” in Japanese. The meat in the spring is very rich and intense in flavor and is lean without any fat which makes it refreshing. Katsuo tataki is particularly nice if you can garnish it with fresh myoga and dress it with a citrusy ponzu sauce. Iwashi (sardines) and isaki (threeline grunt) are just starting to become rich with fat as we approach the rainy season. Thank you for the glossary! The tuna is so beautifully fatty. Love it. Wish I could eat it.